Richway Detoxi 300Hrs Bamboo Salt is a pure high quality nutrient that is very alkaline, helping balance the cellular osmosis pressure, and is not detrimental like common salt. Detoxi 300Hrs Bamboo Salt is very safe. Bamboo Salt is a unique type of all-natural healthy salt. The origin of Bamboo Salt was first produced by Jin-pyo Yul-sa (famous Buddhist priest) during his meditation period at the famous Busa-Uibang (Buddhist retreat located atop Mt. Byun-san) about 1,300 years ago and passed on mainly by Buddhist priests through generations as folk medicine. RichWay Detoxi 300Hrs Bamboo Salt Powder is produced from sun-dried salt that is packed inside the hollow sections of bamboo. It is then burnt 300 hours at 2000°F reducing chemicals which produces superior high quality salt. The high kiln temperatures ensure elimination of heavy metals and toxins. This process creates a very pure grade of Bamboo Salt that contains lots of essential minerals and micronutrients. It has a high content of Phosphorus, Potassium, Copper, Zinc and Sulfur. It has an exceedingly High Oxidation Reduction Potential making it beneficial for all. Regular table salt has a high amount of Natruim. Many food products use Natruim to enhance the taste of a product which is a strong positive ion. High levels of Natrium can cause high-blood pressure and many other health problems. RichWay Detoxi 300Hrs Bamboo Salt Powder is very light salt naturally low in Natrium and high Chloride levels. Because of the low Natrium and high Chloride properties of RichWay Detoxi 300Hrs Bamboo Salt this will not increase blood pressure levels. High Chloride can control the Osmosis Pressure Balance in each cell which is the greatest asset of Bamboo Salt. Calvin Kim says, "Most organ problems are a cellular problem. When the cell does not have a good osmosis pressure level, then it cannot work properly. High quality Bamboo Salt can balance and control osmosis pressure in each cell. This happens because chloride cannot transfer into the cell, so when chloride surrounds a cell, then the cell's Osmosis Pressure level will be down. After a cell's pressure is down it then has a good reaction with infrared rays." When using Bamboo Salt in conjunction with the Bio-Mat, the number one benefit is the improvement on cellular osmosis pressure. Enzyme activity increases and the chloride will benefit the kidneys to help them flush as well as preventing dehydration. One box has 30 individual packets for convenient single servings. Mainly used as a health supplement, Detoxi 300Hrs Bamboo Salt can also be used for cooking, massage, bathing, etc. Bamboo Salt is a great compliment to Bio-Mat high-heat sessions. Mix one packet with 8 ounces of water and drink before a Bio-Mat therapy session or 30 minutes before a meal. Make sure to only consume 1 to 3 packets per day and drink plenty of water. 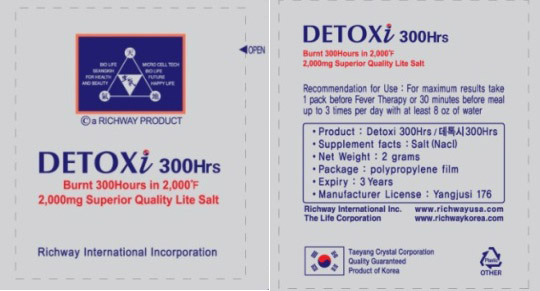 Detoxi 300Hrs Bamboo Salt Powder is available in a single 1 box package with 30 packets, or one carton with three boxes with 30 packets each box.